For chicken spinach meatballs : Preheat oven to 180 C/ 355 F. Grease a flat smooth 9 X 13 inch baking tray or pan. Combine all the ingredients (listed in 'For chicken spinach meatballs' - spinach, ground chicken, garlic,ginger, green chillies, mint, cilantro, parmesan cheese, tandoori masala powder, salt and olive oil) in a medium mixing bowl. Mix well by hand until all ingredients are incorporated completely. Apply a little oil on your hands. Divide and roll the mixture into medium size smooth balls. Place the balls on the greased baking pan. The meatballs should be one inch apart from each other. Cover and put it in freezer for 8-10 minutes. Take out the meatballs from the freezer and remove the cover. Bake in the preheated oven for 25-30 minutes till the pinkness is gone in the center and the chicken is cooked. Combine all the ingredients( 'For meatball sauce -tomato ketchup, Honey BBQ sauce, water, ginger, garlic, onion, tandoori masala powder, red chilly powder, black pepper, garam masala powder) in a saucepan and simmer on low heat till the sauce thickens. Add the baked meatballs and simmer on low heat for 5 minutes or until the meatballs is coated with the sauce. Serve the meatballs hot with sauce and spaghetti or on pizza as meatball pizza. 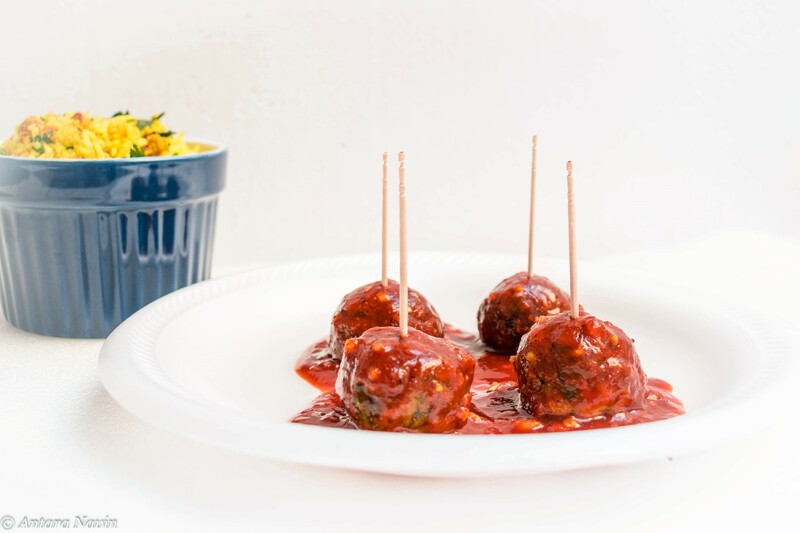 Spaghetti with meatballs (or spaghetti and meatballs) is an Italian-American dish that usually consists of spaghetti, tomato sauce and meatballs. This is my interpretation of this international cuisine, with Indian flavors. You can use all spice powder or madras curry powder or tandoori masala powder or those with Italian taste, use Italian seasoning. Just go with your instinct ! 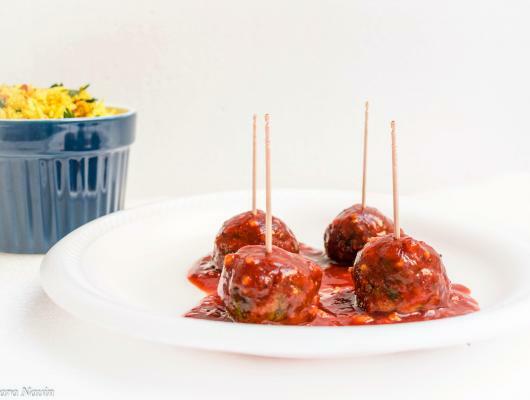 !This recipe of Oven Baked Chicken Spinach Meatballs with Spiced Tomatoes Sauce are moist, flavorful meatballs made from minced or ground chicken and shredded spinach, flavored by Indian spices and fresh herbs. Lean ground chicken or lamb – You can buy ground chicken or as I always do prepare at home. Just take 3 chicken thighs or breasts(skinned and boneless but leave a little white skin for fat) and grind it coarsely in a mixer or food processor. Added 1 cup of chopped baby spinach for more nutrition. No need to remove the stem, just chop it finely. Added Indian curry powder like tandoori masala powder to enhance flavor. You can use all spice powder or madras curry powder or those with Italian taste, use Italian seasoning. Just go with your instinct !! Added reduced fat grated parmesan cheese to make the filling more enriched. Baked the meatballs in the oven rather than fry them. These are also egg free. I prefer to put my shaped meatballs in freezer for 8-10 minutes before baking them. This helps to develop more flavor and meatballs to hold its shape.